Chadd Everone/Ludwig Attempts Inappropriate Personal Correspondence with California Superior State Court Judge, Ronald L. Styn. It has been brought to the attention of the California Valley Miwok Tribe that a recent improper correspondence was initiated by Chadd Everone and his band of co-conspirators whom for many years now, have exercised undue influence over certain individuals in both the state and federal governments. Mr. Everone, in a gesture of goodwill and camaraderie, sent to Judge Ronald L. Styn (of the Superior Court of California, San Diego) a Christmas card of seasons greetings and goodwill. Although, taken at face value this may just be highly improper communication initiated by someone of Mr. Everone's stature, with low ethical standards and legal knowledge that at best, is very lacking. We at the Tribe though feel it raises more questions than it gives answers. Why would anyone send a judge, whom presided over a case that they were involved in, a personal correspondence? The Tribe has have never heard of anyone initiating this type of action. Judge Styn did show throughout the presidings a certain bias towards the tribe and a lack of understanding as to the legal aspects of the issues. He was even appealed to the state appellate court and his earlier decisions which were detrimental to the Tribe were overruled. Was the fix in? Why did Mr. Everone feel he had a connection to this judge that extends past the courtroom? The judge even issued an order remanding the correspondence back to Mr. Everone and his nefarious accomplices. Is this judge trying to officially distance himself as judiciously as possible because of what this implies, or maybe what this proves? Sheppard/Mullin /Richter and Hampton, the firm that represents Mr. Everone, does exercise undue influence within many jurisdictions within the state and federal government and the courts that represent both due mainly to the fact of their corporate size and the power that they wield. On more than one occasion outside of the courtroom, Mr. Everone had been seen thanking and congratulating California Department of Justice attorney Mr. Neil D. Houston for his service, even going so far as to shake his hand and pat him on the back. What does this closeness to a state justice attorney that is not even under his employ imply? As we stated earlier it may just be Mr. Everone's continuing ineptitude and feelings of unrequited love that initiated this action, or can it be that this exposes a much more sinister and diabolical connection that continues to adversely affect the Tribe to this day? Like we previously said this, "raises more questions than it gives answers". To all viewers who visit this site, there has been much activity in recent months perpetrated against this tribe and at the very the heart of the issues are the future of Indian tribal sovereignty over control of their governments and enrollments. Recently, a federal judge allowed the integrity of her court to be compromised by arguments without foundation or historical documentation, and as a result, at least in this case, this tribe's future again rests with the Department of the Interior, with whom this tribe had two Final Agency actions; in which the Tribe, its governance and its membership were affirmed and yet again reaffirmed. Recently, the tribe has been made aware that because of one judge's lack of understanding, that there are those whom now are trying to capitalize and confuse Native American organizations, tribal governments and the general public. Below is a memorandum initiated by Rosette LLP, with documented facts supporting all points made in the memorandum. This is indisputable factual evidence, as it was obtained through way of public access, courtesy of Chadd Everone/Ludwig himself. Mr. Everone, working on behalf of A.D. Seeno, Jr., and the Seeno family of the Peppermill casino chain in Nevada, fancies himself quite the orchestrator of fraud (to hear the braggart himself, please click on the Everone/Ludwig Audio Archives section to the left of this article). Nonetheless, he is also quite the bumbler, without whose help the corresponding documents to this memorandum and the additional 2,500 pages of documentation that the tribe is currently in possession of, would not have been possible. The Tribe has been asked many times how and why this has been allowed to happen and how this continues to be possible. The Tribe will periodically release future documents as evidence to show that when an individual such as casino/homebuilder multi-billionare A.D. Seeno, Jr., hires a law firm such as Sheppard, Mullin, Richter & Hampton (one of the largest law firms in the United States with offices worldwide), and certain individuals with the trust responsibility to work with and protect Native American tribes from Abramoff-type situations, fail in their trust responsibilities and in some cases, even become willing participants, then this will happen and continue to do so. The only way this will ever stop, is when ethical people of high moral fiber, well-versed in federal Indian law and well-established Indian policy implement for the third and final time, a decision based upon that criteria; and direct minor officials to enforce that decision regardless of whatever their personal opinions or feelings towards this tribe and re-establish their trust responsibilities. Below please click on the links to the view pages actually taken from the court-ordered depositions of Chadd Everone/Ludwig and Yakima Dixie, referenced in the Indian Country Today story "BIA Should Not Be Allowed to Make Enrollment Decisions for Tribes" by Honorable Chairperson Sherry Treppa. Under advisement from our many supporters whom wish to contribute to further the Tribe's continuing fight against the injustices wrought upon it by corrupt government officials (in collusion with greedy developers networking with local opportunists trying to pass off phony non-tribal peoples as the California Valley Miwok Tribe), The Tribe has now established a donation account. If you would like to contribute to our cause, please click the donate button, located to the left of this message. Being we are legitimate Tribe, we have an Internal Revenue Service EIN and non-profit status. So please keep record of any donations for future tax credits. Thank you for your support. The legitimate California Valley Miwok Tribe, being the possesser of the only two tribally ran sites on the internet - one being a United States government-sanctioned website and this site (containing factual information that the United States government (BIA/DOI) deemed too revealing to allow us to post in continuing to bring awareness to the facts, deceit, criminality and corruption) shall now have featured writers’ postings to give everyone whom reads this site a journalist's point of view. Featured this month is an indigenous writer that goes by the pen name of “Buffalohair”. He is an independent and blatantly honest reporter whom thoroughly researches and compiles all the factual information that he then assesses before putting pen to paper. This writer has much experience himself with the federal government and he (himself) is a member of an indigenous tribe. And as such, he has great introspect and is in no way fooled by the misrepresentations or immorality of the type of individuals that continually cross this tribe's path. Read his latest column below and enjoy. In a Thursday morning raid 30 FBI, IRS and Secret Service agents stormed the offices casino mogul, land developer, contractor *Albert Seeno and his associates with search warrants in this quiet Concord California community. The exact nature of the raid was still under seal of the court. According to William Goodman, attorney for the multi faceted business empire the Seeno family was working with investigators to resolve the situation and were confident they would reach a positive resolution to the matter. The smorgasbord of federal agents has caused some speculation as to the true nature of the raid and seizure of documents. Seeno enterprises range from construction to casinos with a multitude of other lucrative businesses that span several western states including California and Nevada. The list of political beneficiaries to the Seeno family’s generosity spans both sides of the political isle Are their nasty little secrets about to get exposed? The media listed a host of past criminal complaints that were lodged against the Seeno Empire in the past ranging from environmental to financial foibles. Millions in fines and penalties have been paid out over the years by this firm and it would appear they are set to pay out more green stamps if criminality is found again. But the media as a whole forgot to make mention of a current complaint that was lodged against the Seeno empire and that is with the California Valley Miwok Tribe. From court documents it was discovered that Seeno and associate Chadd Everone were involved in a multi state scam to remove members of a federally recognized **Native Tribe and replace them with non natives who would allow for the Seeno’s to build a casino in California. Apparently the Peppermill Casino’s Incorporated, A Seeno holding, was not happy with their lucrative enterprises in Nevada. Chadd was mentioned in one complaint selling tribal cards to bolster the number of non natives to claim Miwok lineage in an effort to throw out the true blood line and real Miwok people. Mr. Everone also started several web sites under the Miwok tribal name in an effort to legitimize his bogus band of Miwoks. Albert Seeno was clearly identified as the moneyman behind the criminal act of fraud and identity theft as well. The plot thickens since the California BIA as well as other authorities not only did nothing, they assisted the Seeno’s in perpetrating this crime. The California BIA shuttered the tribes funding forcing this beleaguered band of natives to fend for them selves regardless of the fact they were a federally recognized tribe. Tiger, the tribal consultant, joked that this is the only federally recognized tribe that is operated solely on unemployment insurance. Granted, it was dark humor at its best but from Tigers vantage point cynicism replaced faith in the political system long ago. Their last bastion of tribal land went into foreclosure since the state and federal governments failed in their obligation to uphold the law. The state and feds played ball with the Seeno scam by making it all but impossible for this tribe to exist by shuttering their funding since 2007. Calculated and divisive is the only way to describe how politicians and unscrupulous corporate interests have financially crippled this humble tribe of people just to build another casino. Are state and federal agencies going to stand behind the tribe now that death threats have been lodged against these people or is the government going to send in their own hit men to whack the tribe? I wager it would be the second choice eh. I can almost hear Gary Owen being played as government troops prepare to wipe out the Miwoks. Is this our contemporary Manifest Destiny and wave of the future? Director of marketing for the Peppermill Casino Corporation in Reno NV., Bill Hughes said the Seeno situation in California had nothing to do with the casinos in Nevada. It would appear this raid has only opened a Pandora’s Box of intrigue. Now there will be focus on politicians who’ve allowed the Seeno’s to do as they wished in Northern California as well as wage war on a sovereign tribal nation to steal their identity for a casino. Though Hughes said there was no connection in the case and the Peppermill Casino Corp it would behoove Renee Shaffer of the Nevada Gaming Commission to look deeper into Seeno and Chadd Everone’s exploits since they were involved on both sides of the Nevada border with regard to the California Valley Miwok Tribe and casino gambling. Or does Harry Reid have the Seeno’s back on this one? No doubt Harry Reid’s involvement or lack there of will be called into question. Dirty Harry was a scoundrel in his own right anyway. Oh well, to bad so sad Harry. With an affluent businessman armed with loads of cash and an army of morally bankrupt politicians the Miwok people face insurmountable odds in surviving the onslaught that has besieged this impoverished nation. Where the hell is Secretary Ken “Howdy Doody” Salazar since he was notified by the tribe about the crime being committed in his jurisdiction and on his watch? After all he is the Department of the Interior mast head. Is Ken in the deep pockets of the Seeno Empire as well? How come all these hot shot natives appointed to the Obama administration are not raising a stink? Aren’t they supposed be on the side of justice and Indigenous issues or are they simply political eye candy? The real issue in the California Valley Miwok case is tribal sovereignty because if corrupt politicians succeed in stealing tribal lineage from one nation they will make a dangerous precedent. Other tribes will be caught in the crosshairs of corporate greed and ultimately loose their birth right to satisfy the needs of corporate interests. Silly me, this is happening throughout the Central/South America and Africa since the needs of corporations overshadows the concerns of Indigenous populations already. On the bright side, the plight of the California Valley Miwok Nation is no longer a secret Californian act of corruption for now the whole world is becoming aware of this crime. The world is coming to know who all the players are in this identity theft scam including some very prominent politicians. There is no question more dirty politicians will be rousted from the fetid depths of deceptive practices as this investigation delves deeper into the matrix of the Miwok scam. Like David and Goliath, the California Valley Miwok Tribe is standing in defiance against a giant casino/construction mogul with deep pockets and powerful political friends. And from what I gathered from conversations with the tribe, the California Valley Miwok Tribe will fight to the last breath to save their nation. In all reality these human beings have no other options since they are fighting for their very existence. On January 28th, 2010, I was given the opportunity to speak to Ms. Silvia Burley, Chairperson of the California Valley Miwok Tribe and Mr. Tiger Paulk, consultant for the Tribe. This is a story only movies are made from. I was given information about the illegal withholdings of tribal funds of the Indian Gaming Revenue Sharing Trust Fund (RSTF) monies that have been illegally stopped by the California Gambling Control Commission since2005. The tribal members of CVMT had recently been given a notice to vacate the property located at 10601 Escondido Place, (Morada) Stockton, CA 95212 from the San Joaquin County Superior Court, Case No. 39200900210084CLUDSTK, (One West Bank vs CVMT), an Order to vacate immediately. A letter written on behalf of CVMT by Tribal attorney Saba Bazzazieh, Esq., of Rosette & Associates 565 West Chandler Blvd., Suite 212, Chandler, Arizona 85225 asking for a 30 day extension of time was denied by One West Bank. This property of one and one half acres has been considered by the tribe to be its reservation and has served multipurpose functions in regards to the 10 tribal families it services. On January 15th with no extension given, the Tribe with the support of various activist organizations and the local community went back into lockdown to defend its Tribal land until late in the afternoon when the bank relented and gave the time for the current suit against the CGCC to be heard in the California Appeallant Court in San Diego. The California Valley Miwok or “Sheep Ranch Tribe” has been a federally recognized tribe since 1915. In 1915 the tribe was allotted 0.92 of an acre and in 1966, Ms. Mabel Hodge Dixie was identified by the government as the sole authority for the Tribe. At this time, the Tribal landbase was relinquished to her as an Individual. Upon her death in 1971, the landbase was probated to be distributed among her heirs with its most recent resident and Spokesperson being Yakima Dixie, before the formal Tribal organization of 1998. In 1998 the Tribe expanded to 5 members and sought government contracting. In 1999 they acquired their first ever PL-93 638 contract under the leadership of newly elected Chairperson Silvia Burley. They were trying to organize under IRA but due to the local BIA’s mishandling of their request and subsequently trying to force non-Tribal people onto the Tribe, the Tribe exercising their sovereign authority rescinded their request for a Secretarial Election and voted to organize under Custom and Tradition. In 1999 the state of California initiated compacts with Gaming Tribes. Within these agreements was language that Compact Tribes provide monies to the state gaming commission Revenue Sharing Trust Fund (RSTF), as a federally recognized Tribe, as listed in the federal register the California Valley Miwok Tribe is eligible to receive quarterly distributions from the Revenue Sharing Trust Fund. In 2000, Yakima Dixie as Vice Chairman became influenced by Mr. Chadd Everone aka Chadd Ludwig, a non-native, whom was brought in by Le Roi Chapelle and William “Bill” Martin to help facilitate control of the tribe. Yakima under the control of Chadd Everone then decided to challenge Ms. Silvia Burley’s position as Tribal Chairperson. The Tribe has successfully defended against time and time again. Protecting it’s elected leadership and Tribal sovereignty that even though Mr. Dixie was not the recognized Tribal authority he tried to give away. When, what later became known as the Everone Group discovered in December of 1999, through Ray Fry, Tribal Operations, BIA / CCA, that Mr. Dixie was not the chairperson nor the leader of the tribe, Bill Martin and Le Roi Chapelle conspired with Chadd Evereone to manipulate Yakima Dixie’s role (who had no authority to sign any contracts or agreements on behalf of the tribe and certainly no authority to put the sovereignty of the entire tribe in jeopardy). Nor had he the authority to sign the proposed agreement with the fictitious group created by them known as ABC Boxing, Inc. and/or Martin/Chapelle Group. Upon the discovery of the true Chairperson being Ms. Silvia Burley, in 2000, Mr. Everone aka Mr. Ludwig was brought in to orchestrate and initiate an agenda of deceit and lies that a few opportunists in the DOI / BIA have used to diminish the tribal rights, as a way to oust the legitimate body of tribal members that will not surrender their sovereignty or adhere to their preposterous agenda to take over the tribal existence. In regards to CVMT’s ongoing court battle with the state of California Gambling Control Commission, Ms. Rose Davis and I met with Mr. Manny Corrales, Esq. tribal attorney, he gave us a rundown of events and court proceedings up to this point. He was very adamant that tribe’s rights were being violated. He was confident that the court case would be won and the Revenue Sharing Trust Fund (RSTF) monies would be released to the California Valley Miwok Tribe and that an Writ of Mandate order to comply would be instated. On February 9, 2010, at 1:30 pm in San Diego, state of California Court of Appeals,4th District division, court case # D054912, between the California Valley Miwok Tribe (CVMT) vs. State of California Gaming Control Commission. A three judge panel heard arguments of the ongoing litigation of the unjustified withholding of the yearly distributed $1.1 million dollars California Gaming Compact, Revenue Share Trust Fund (RSTF) allocation to the CVMT. CVMT Legal Counsel Manny Corrales supported by the lawyers, Juan Carlos Sanchez & Jorge Luis Barraza of the Singleton & Associates law firm presented argument and clarity of statutes pertaining to RSTF yearly tribal award. Issues discussed for review was “authority over distribution of monies funded to the tribe, tribal membership and the federal government 638 contract allocation of $100,000.00 yearly award. Argument of the Indian Board of Indian Appeals vs. federal tribal recognition, that it was understood that the IBIA has no authority or jurisdiction over the CA Gaming tribal accounts and that the California Gaming Compact is not a requirement of the Indian Reorganization Act. The CVMT Legal Counsel Mr. Manny Corrales was very well prepared and presented and outstanding argument of facts and statutes of the CA Gaming Compact in regards to the proceedings. The prosecution for the state of California seemed less confident and often times contradicted themselves in defense of their case. After the summary & rebuttal was heard the judge’s panel gave notice that “the matter is submitted for further briefing and review.” This is a 30 day process in which the state of California Court of Appeals judges’ panel will make judgment. Keep Their Land – Stop The Eviction! Please join us! We need community/public support! The California Valley Miwok Tribe has again received written permission from an unbiased and investigative reporter whom is just trying to uncover the truth as to what is taking place in our Tribe's troubled affairs, unassociated to either the real tribe, located at 10601 Escondido Place, Stockton, CA - or the transparently criminal faction ran by Chadd Everone/Ludwig. Here below is reporter Andy Kreamer's perceptive and in-depth article that appeared in Poor Magazine Online, on Friday, Jan 8th 2010. The California Valley Miwok Tribe thanks reporter Andy Kreamer for this truly magnificent in-depth article. Hoping to stave off the eviction, the California Valley Miwok called for a 2-day protest and speak-out gathering at the Bureau of Indian Affairs recently on January 6th and 7th. The BIA was targeted because they have been withholding funds that the CA Valley Miwok need in order to pay for their land, and also because the BIA could push the California Gambling Control Commission (CGCC) to also release funds due to them. The CA Valley Miwok don't have a casino, so under the Indian Gaming laws they are entitled to revenue that gets taxed off the Tribes that do have casinos. Brightman, Burley, and a lawyer for the CA Valley Miwok were able to get a meeting with Troy Burdick, head of the Central CA BIA because of the commotion caused by the events. They demanded that the BIA tell them the reasons why the money has not been released to the CA Valley Miwok since December 2007. In addition to paying for their land, the money is needed for medical insurance, education, and the welfare of children. The group also brought up some other concerns that they want to BIA to consider and investigate: ï¿½In South Dakota the Crow Creek reservation is being sold by the IRS to pay off that Tribe's unpaid taxes- but Native Tribes are like non-profit organizations, we don't have to pay taxes, so why is the IRS involved with a Tribe at all?ï¿½ questioned Quanah Brightman. They also pushed the BIA to take a stand to protect Indigenous Sacred Sites, the traditional burial ground in Glen Cove, Vallejo, CA in particular. Finally, they demanded that the BIA grant 'Federally Recognized' status to all Tribes who currently have only 'State Recognized' status, because these people are being denied Federal protection of their human rights and desperately needed services. There are over 500 Tribes that are not Federally Recognized, and 76 in California. Many of these California Tribes need the Federal status so that the remains of their ancestors can be returned to them from anthropology museums across the State, including UC Berkeley and UC Davis. On Thursday afternoon the lawyers for the CA Valley Miwok heard that there have been 2 meetings in Washington D.C., and the matter is being discussed very heatedly. The decisions will be made there by the new BIA director Larry Echohawk instead of in California. This is good news because folks have only gotten the run-around here at the California office of the BIA. Before their meeting with Troy Burdick about the funds from BIA and also the CGCC, Burdick has said that the ï¿½BIA doesn't have any authority to tell the CGCC to hold or release your funds because they are a State Agency that we don't have any control over.ï¿½ This while the CGCC says that they cannot release the money without authorization from the BIA. Chadd Everone/Ludwig has gotten the BIA office to view the Leadership of the Tribe as 'in dispute,' which the BIA is now using as a reason to withhold funds; even though the BIA considered the leadership to be in dispute for years and released funds regularly for years, because the funds go to the Tribe and not the leader anyways. There are now an unknown, and growing number of people with CA Valley Miwok identity cards who have not registered yet with the legitimate Tribe nor the BIA. A group of these people came to the protest on Thursday and were reportedly paid $1000 each by Everone/Ludwig to be there, when they were questioned by a man who went to the protest about whether they wanted to build a casino or not they changed the subject. ï¿½Straight up identity theft of Tribes' names is real, and it's happeningï¿½ says Cesar Caballero, of a nearby band of Miwok called the Shingle Springs Miwok Tribe. His Tribe's name was stolen in the 1970's and 1980's by some people of Maidu/Hawaiian bloodlines who were living near Sacramento. A bit later they worked with two white guys from Vegas named Kevin M. Kean and Jerry A. Argovitz and the local BIA office to be instated as leaders of the Shingle Springs Miwok Tribe. Kean and Argovitz then arranged for a whole succession of deals to be signed by the Tribal Impostors, ultimately resulting in an agreement between the Tribal Impostors and Lakes Entertainment- a company that has deals with 4 'Tribes' in 4 different States. The eviction of the CA Valley Miwok is currently scheduled for January 15th, in Stockton. A temporary restraining order and an injunction have been petitioned for, but not granted. 'Please send letters, faxes, and or emails to your elected officials, and also leave voice messages regarding how appalled you are about the Bureau of Indian Affairs allowing such abuses to happen to a federally recognized Tribe, for this has gone on (years) too long!!! Do not allow the lies of Chadd Everone and his Gaming Developers (financial backers) to continue to cover up the truth of what they have been doing to destroy us. DEMAND AN IMMEDIATE INVESTIGATION INTO THE CRIMINAL ACTIONS OF THE LOCAL BUREAU OF INDIAN AFFAIRS/CENTRAL CALIFORNIA AGENCY, and SUPERINTENDENT TROY BURDICK, REGARDING HIS WORKING WITH CHADD EVERONE AGAINST OUR TRIBE. The California Valley Miwok Tribe (located at 10601 Escondido Place, Stockton, CA 95212) held a two day protest at the John Moss Federal Building - located at 650 Capital Mall, Sacramento, CA. This building houses the Central California Agency of the Bureau of Indian Affairs. The Superintendent in charge, Troy Burdick, is responsible for initiating all actions on behalf of the government in working with non-Indian, non-tribal members and powerful and politically connected developers to drive this sovereign tribe and its proud people into financial oblivion to be able to then seize the Tribe's inherent sovereign rights and exploit those rights for their own financial gain. Due to the nefarious actions of developer-sponsored individuals and also officials within the BIA, the Tribe, is now facing a second threat of eviction on January 15th. One West Bank whom holds title to the tribal property, has patiently waited these long seven months in utter amazement that the federal government has been unable or unwilling to rectify the situation that they themselves have created. The bank now feels that they have no other alternative but to move forward with the proposed eviction. This new and much more dire situation has not gone unnoticed by the community. The Tribe now has an abundance of organizations and supporters that came together to host and attend an event that not only addressed the disdain felt by all against Interior officials' ineptness but by their criminality against the California Valley Miwok Tribe and her people. The BIA/DOI has so violated the very existence of this Tribe that now it has come down to the question of violations against the members' very civil rights, but now with all the positive energy flowing, this proud tribal nation's search for Justice shall not be thwarted. Being supported by righteous organizations that fight for the betterment of all the peoples whom they represent and now all coming together for one cause. It is truly a strong and positive period in time in this Tribal people's history. This event is just the beginning and it was enhanced even further by the negative presence of the criminal factions attempt to also be there huddled in a little out of the way corner on the federal buildings grounds. Many new supporters were made and existing relationships strengthened just by these individuals exposing whom they really are. They were so transparent that all whom came to attend in a good way could see their true nefarious and criminal intent. So we thank them also, for it strengthened the spirit and righteousness of the protest. The winds of change are upon us and a positive river of support is now fully flowing in the Tribe's direction and as the writer of this article I will not taint this now positive force bestowed upon us by the Great Creator by even the mentioning of any of their names for fear of bringing forth the negativity of these criminals that if given the opportunity would steal the identity of this proud tribe so that they and their developer may have a casino that they have no right to. We would like to thank the creator for giving us the strength to fight for these so many years, for the representation that has now come to assist the Tribe in acquiring legal justice, to all of the individuals who came forth to support the Tribe and to all of the organizations listed below that have assured the Tribe that they shall stand strong with us and that we shall endure. The Tribe gives thanks to the Great Creator for your support and allegiance in the continuing struggle to right the injustices wrought against it by those without moral or ethical conviction - together WE SHALL PREVAIL! We the Tribe thought that to further demonstrate that Chadd Everone/Ludwig and his dominions have no legitimacy, we should now display his most recent legal attack to date that has already been decided upon. Through his attorneys, Chadd Everone/Ludwig attempted during the first eviction threat to our tribe, to acquire through the federal courts ownership to all of the tribe's files containing all current information and complete history of everything that this tribe has ever done in the course of its relations and day to day business. Of course, Mr. Everone/Ludwig needs our files if he is ever to one day build his own tribe, for he doesn't know the first thing about how a real tribe operates. Why would he? He and his phony group are not a real tribe, he has never worked for a real tribe and he is not a member of any tribe - currently or in the past. He is not even of any American Indian ancestry. Although Mr. Everone/Ludwig tries to take credit every time the Tribe suffers injustices within the federal legal system, mostly due to lack of specified relief, statute of limitations, late filings and unconvincing or weak arguments by previous attorneys - these cases are between the legitimate tribe and the federal government. The Tribe has always prevailed against Mr. Everone/Ludwig and his attorneys whenever they initiated a filing against the tribe. The courts as listed below have always found in the Tribe's favor where Mr. Everone/Ludwig is involved. Please note that the document can be confusing to someone not accustomed to Mr. Everone/Ludwig's style, for in the filing he represents that they are the tribe even though the name is copyrighted and that they are suing our Chairperson, Silvia Burley, as an individual. Now if they are really the tribe, why would Silvia Burley, "the individual", have all of their files? Please note: The first reason listed is that the court found that they lack standing because they in no way are or ever were representative of the California Valley Miwok Tribe. Below in pdf. form is the court ordered sanctions against Mr. Everone/Ludwig's attorney, Mr. Thomas Wolfrum. The first cause listed for the sanctions is that they lacked standing to sue. They and their group are in no way affiliated with the tribe and the judge understood that fact. The judge was just in his decision and as Mr. Wolfrum scurried back into whatever cave that he came from to lick his wounds, the Tribe is hopeful that he will think twice before attempting something as frivolous as this again. Please note: Sanctions were granted in favor of the defendant, Silvia Burley (who is the duly-elected chairperson of the California Valley Miwok Tribe). The California Valley Miwok Tribe webpage staff, upon learning of the abundance of support generated by a recent release by Chairperson Silvia Burley, decided in an attempt to inform the general population that it would display the release on this site. The December 16th "Please Pass This Forward" release is printed below in its entirety. Once again, we are being threatened with a forced eviction due to the Department of the Interior/Bureau of Indian Affairs ineptness of actions to do anything to assist or protect our Tribe. The governmentsï¿½ failure or intentional lagging to correct the abuses and inflictions caused to our Tribe by the corruption within the local BIA's Central California Agency and Superintendent Troy Burdick who is personally working with and allowing outside influences to viciously attack and interfere into our Tribal Affairs is now on the brink of causing more serious concerns. We have continued to forward documented factual information (including the criminal histories of the individuals plotting against us) to the BIA/Dept. of the Interior and our local elected officials, and they still have not stepped in to stop the continued criminal actions (fraud and identity theft) being perpetrated by Chadd Everone and his phony group. Mr. Everone continues to mislead government, court, and other agency officials to believe that he and his attorneys represent our Tribe. We need your support. We need our story to be put out all across America and abroad. All those who can help us get justice, please come forward. Call your friends, Tribes (recognized or not), Universities, Veterans, Students, Elected Officials, and anyone who can step up and stand with us to get the government to take notice of the hardships and emotional suffering that is being cast upon our Tribe and its members. Due to our local Governor, Congressman, Senators, Assemblymembers, etcï¿½ turning a blind-eye to our cries for justice, we are now asking you (the Public) to contact your Congressional representatives, Senators, and Assemblymembers, etcï¿½ to help us. We are requesting that all people who know what its like to have an injustice done to you and who can remember how it felt for people to walk away without helping, or for those who had been wrongly accused and had to stand alone and fight through the tears and frustration to be ridiculed and finally justified in the end when the truth came out in the open, you are the ones that we are asking to step up and help us. Please send letters, faxes, and or emails to your elected officials, and also leave voice messages regarding how appalled you are about the Bureau of Indian Affairs allowing such abuses to happen to a federally recognized Tribe, for this has gone on (years) too long!!! Do not allow the lies of Chadd Everone and his Gaming Developers (financial backers) to continue to cover up the truth of what they have been doing to destroy us. Demand that an investigation be set forth. Appointed and elected officials get paid by our tax dollars to protect their citizens. Why is it that they have deaf ears to our situation? Is it because we are Native American Indians? Is it because they just donï¿½t care? The last I remember, identity theft and fraud was illegal in this country, so then, why isnï¿½t Chadd Everone not in jail? Is the Government waiting for one of us, or all of us (in the Tribe) to be seriously or fatally injured? What is going to happen on January 15th 2010 when the Sheriffï¿½s department comes in to force the Tribe and its members out into the street? Will the American Indian Movement come to stand with us? Will the college and university students come to stand with us? Will our local community stand with us? The system of law and righteousness has failed us. Please help us !! Again and again, weï¿½ve tried to negotiate, weï¿½ve tried the courts, weï¿½ve tried to be patient but unfortunately words donï¿½t pay the bills. One West Bank wants to get paid. WE WANT TO GET PAID!!! THERE IS NO LEGITIMATE REASON FOR THE CALIFORNIA GAMBLING CONTROL COMMISSION TO WITHHOLD OUR RSTF MONEY!!!! NOR IS THERE ANY LEGITIMATE REASON FOR THE LOCAL CENTRAL CALIFORNIA AGENCY/BIA TO WITHHOLD OUR MATURE STATUS 638 CONTRACT!! !THEREFORE WE ï¿½THE TRIBEï¿½ ARE ASKING YOU ï¿½THE PUBLICï¿½ TO DEMAND THAT OUR FUNDS BE RELEASED!! DEMAND AN IMMEDIATE INVESTIGATION INTO THE CRIMINAL ACTIONS OF THE LOCAL BUREAU OF INDIAN AFFAIRS/CENTRAL CALIFORNIA AGENCY, SUPERINTENDENT TROY BURDICK, REGARDING HIS WORKING WITH CHADD EVERONE AGAINST OUR TRIBE. The truth is in the files, all one has to do is investigate!!! ï¿½Chadd Everoneï¿½ (who is a non- Indian and is not in any way associated with our Tribe, other than trying his best to steal it) has an agenda to cinch his Gaming Agreement with Albert D. Seeno, to build ï¿½the Biggest Casino in Northern Californiaï¿½ but to do that, he must replace us with his phony group. We the California Valley Miwok Tribe are asking all of you out there, to please make the calls, write the letters, emails, blogs, twitter messages, radio and tv announcements. Contract your friends, if anyone knows of any actors who are willing to help us get justice, any one who has influence in the media whether it be youtube, rez radio, newsletters, newspapers, banners, flyers, one-linersï¿½. Anything helps!! While (as another year is set to pass), once again, Government Officials (Bureau Officials included), etcï¿½ are readying themselves for the holidays!! Again, they have NO TIME for our concerns, our fears, our cries or our suffering, or our REALITY!!!. SCROOGE IS ALIVE AND WELL . . . WE NEED YOUR HELP!!! For more information on how to help the Tribe, please contact us at the Tribal office at 209.931.4567 or by fax 209.931.4333 or you may contact the Tribal attorneys at Rosette & Associates, PC at 480-889-8990. IT SHOULD BE THE GUILTY BEING PUNISHED . . . . NOT THE INNOCENT!!! Put yourself in our place and think about how youï¿½d feel if you were the one that was quiet and shy and had a bully constantly abusing you. Please make a difference, make the contacts, get President Obamaï¿½s attentionï¿½ let him know that you want change, and that the American public supports the rights of the Native American Indians. Let him know that the California Valley Miwok Tribe needs him to step in and save it from being destroyed due to the lack of action(s) by appointed and/or elected officials who are either unwilling or unable to step up and do their job to protect this Tribe from those individuals who are causing the ï¿½Tribeï¿½ GREAT harm by using illegal tactics such as identity theft and fraud to discredit it, destroy it financially, and leave us homeless and without any recourse to defend ourselves. The California Valley Miwok Tribal Office today recieved written permission from Chelsea Kolander to display on our site an article written by her in "The Collective Voice", the newspaper of the University of California, San Diego. The Tribe thought that as the story of what is really happening is being understood by reporters such as Ms. Kolander, that it would be beneficial to visitors to also see an in-depth and unbiased reporter's point of view, whom has no membership or financial allegiance to either the true California Valley Miwok Tribe or the criminals and distorters of truth Chadd Everone and his legions. We would like to thank staff writer Chelsea Kolander for permission to display the story from "The Collective Voice", Volume II, Issue I - Nov 2009. Even in 2009 Native Americans are being forced to fight to maintain their land because they could still lose their land at a moment's notice, and this frightening situation is now taking place as the federally recognized California Valley Miwok Tribe (CVMT) is doing everything in their power to preserve their land and their culture. The CVMT has a rich history and culture and are one of the many tribes who first inhabited California. Their lands are located in the Stockton, CA area. As I write this, the members of the CVMT are struggling to maintain their homes and survive as outsiders are threatening their land, culture and sovereignty. Their sovereignty has been threatened for nearly ten years by a non-Indian named Chadd Everone (formerly known as Chadd Ludwig) and other non-Indian people who are posing as members of the Miwok Tribe. They do this to establish a casino and generate profit. In order to do this they would need to remove the real Miwok people from their land. The CVMT is a non-gaming tribe and wants to remain that way. Chadd Everone and his accomplices have been meeting with the Bureau of Indian Affairs (BIA) and have begun the paperwork to remove the legitimate Miwok people from their land and establish a casino. Additionally, they have enrolled themselves as members of the Miwok Tribe to receive health care and other services available to Indian people. Everone has been convinced the former Chairperson of the California Valley Miwok Tribe (CVMT), Yakima Dixie, into supporting the development of a casino. Dixie has been convicted of viciously murdering Lenny Jeff, the great uncle of the current Tribal Chairperson Silvia Burley, in 1978. He has also made multiple death threats to legitimate tribal members including Tribal Chairperson Burley. The Miwok people are a strong people and they are taking actions to preserve their land and their culture. The Miwok tribe is confronting constant attacks from Everone and his accomplices, the BIA, and even the California Department of the Interior, a legislative body that is supposed to protect and uphold the sovereignty and rights of federally recognized Native American tribes in the United States. The Tribal Chairperson Burley has been advocating for her people. She has travelled all over California and the nation to meet with other tribes and people in positions of power who are able to help the CVMT retain their land. Just before her appearance at the 2009 Students of Color Conference held at UCSD, Burley met with President Obama to voice the concerns of the Miwok tribe. In a recent conversation she stated that "When it comes down to surviving, you do what you have to do." Also write to your elected officials at the local, state, and federal level to demand that the Miwok Tribe will be guaranteed the right to remain on their land, to exercise their sovereignty and right to preserve their culture. They are also accepting monetary, clothing and food donations. The California Valley Miwok Tribe had another successful Food Distribution on July 13th and members from at least four tribes showed up for services this month. It is a shame though that they had to brave sweltering heat and lack of restroom facilities during the distrubtion, due to the premises having to be secured because of Troy Burdick and the local BIA's involvement to assist a takeover of the Tribe by A.D. Seeno, Jr, of Contra Costa - a very corrupt and greedy developer whom finances the illegal activities of Chadd Everone/Ludwig, a non-indian and Velma Whitebear, of Mexican and Portuguese descent, to take this Tribe from its longstanding members and as Chadd Everone states, "build the biggest casino in California right here in the valley". Big it would have to be, just to compensate for the amount of support he has recieved from Mr. Burdick and the local BIA, but individuals such as these have no understanding of the strength of Indian peoples. Many whom showed up for the distribution were upset that the government can do something so wrong and assured the Tribe that if needed, they would brave much hotter days to come back in defense of the Tribe if that time should ever come. For the support of these true Native Americans and all of you that have spread the truth and continue to support the Tribe, we thank you. While watching a classic movie yesterday, "Mr. Smith Goes to Washington", circa 1939, starring Jimmy Stewart, we members of the California Valley Miwok Tribe, realized that our Tribe's personal story is not so unlike his. Our Tribe received federal recognition from the U.S. Government in 1915, but as of today, much of our inherent sovereign rights have been ignored or outright disregarded by the Bureau of Indian Affairs (BIA). Even though the BIA acted as if they would help the Tribe in whatever direction it wished to go. Silvia Burley was in college pursuing her degree when the acting Chairman of the Tribe voluntarily resigned from the position, citing a desire to pursue other interests. The General Council appointed Silvia Burley to act as interim Chairperson. An Election of Officers was held on May 8, 1999, in which Ms. Burley was unanimously elected Chairperson. Officials within the BIA were enthused to work with the newly-elected Tribal Council, perceiving them to be naive, gullible and probably easily controlled. Those persons working within the BIA, no doubt, were salavating over all of the ways that they could mislead and redirect this Tribe away from achieving the goals which the Tribal Members asked of their Tribal Council to accomplish - but much like the Mr. Smith story - the Chairperson and Tribal Council became quick studies. Even though the Tribe did not quite fully understand sovereignty or all that it entails and to this day, have not been allowed their rights to it under federal law, they knew it was something worth fighting for, even if it was no more than an idea that must be protected. We do not feel that agents of mortgage companies thought as children, "When I grow up, I want to throw people out of their homes" or that BIA officials thought, "When I grow up, I want to destroy my people, their culture and take from them their sovereignty" or that politicians thought "When I grow up, I want to represent the rich and powerful at the expense of the common man's futures", but all these situations are now upon not only the Tribe, but upon all of the American people. As the BIA began forcing their will upon the Tribe, the Tribe was advised to seek economic opportunities to prevent financial alienation which could be exacted against them by corrupt beaurocrats, as a means to bring the Tribe to its knees and force it to capitulate to the BIA's incredulous demands, which is exactly what has now happened. Much like the "Mr. Smith.." story, large and well established corporations started seeking favor with the Tribe, promising much and delivering nothing. It soon became apparent that they too looked at this little-known Tribe as a opportunity to be exploited for personal gain. Their true motivations revealed, they disappeared from the scene as quickly as they had appeared. During all of this, the Tribe has for these many years tried countless times to even secure but one meeting with any of their state or federally elected officials - whom have largely ignored the Tribe and their requests to personally present their case to these persons - but much like the "Mr. Smith.." story, these individuals were elected to office with the help of special interests and corporations; an exclusive club in which the Tribe has no membership. Now is the time, like the "Mr. Smith.." story, that someone, somewhere with the power or influence to right all the years of wrongdoing against this Tribe, needs to find the courage to harken back to their own upbringing, when their parents taught them the importance of ethics and morality; things that in the field of government/politics and business, in a modern society, are often convoluted, lost or forgotten altogether. Sometimes we as people should do the right thing - not because it is easier, not for personal gain and not even for notoriety or personal glory, but simply because it is the right thing to do. This is why our country is currently in such dire straights financially, legally and politically, because those in charge of our institutions choose to ignore their moral and ethical obligations to those whom they are supposed to represent. Doing the right thing is never the easiest, but is always the simplest thing to do. It only gets complicated when people personally try to confuse a very simple situation to be able to do the wrong thing and then try to get away with it. The Great Creator willing, the Tribe shall continue making the Food Distribution Program available to all needy indigenous peoples that qualify through the USDA Food Distribution Program regulations. We are still here and standing strong, defending our sovereignty against those who would oppress us. The criminal group led by non-Indian opportunist Chadd Everone/Ludwig and overseen by multi-billionaire casino developer and home builder A.D. Seeno, Jr., (assisted by Troy Burdick, Superintendent of the Central California Agency - Bureau of Indian Affairs) will not help others outside their group. If you find their fraudulent website, it acknowledges that fact, as it only speaks of themselves and shows that they only consume benefits, but offer no actual services other than lies and deceit about the real tribe and its members; as well as expressing joy over the loss of Indian-held property and the impending homelessness/suffering of Indian peoples, but we shall overcome with the help of all of you whom have taken a personal interest in our plight and have become standard bearers of the truth; we thank you. We can only hope that these sites will someday be seen by President Obama himself, so that he may see that this tribe is a community organizer, focused on assisting in the betterment of our peoples, much like the nation's President stated he was, as a platform in his quest for the presidency. To enable the public to better understand the issues behind our ongoing crisis, we have made the following documents available. For more information, you can also listen in on a live discussion, hosted by DreamCatcher Entertainment, which will be held this evening at 6pm, PST on BlogTalkRadio. Click this link to listen to the programme. NOTE: Interference by outsiders into tribal government affairs is supposed to be illegal and tribes are supposed to be protected from these kinds of actions by the Bureau of Indian Affairs and the Department of Justice. Concerned students of the University of California - San Diego, have stepped forward and created an online petition in support of the California Valley Miwok Tribe, whose members are currently facing the threat of forcible eviction from the only property that the Tribe possesses, which for so many years has served as a Tribal Office and lodging for Tribal members; bringing for the first time in the Tribe's history, a central location which provided the stability needed to efficiently conduct Tribal business, as well as support the cultural events and services which helped to empower the Miwok people. As a tribe.. as people.. as grandparents, parents and children, we are asking for your support in our darkest hour. Please stand with us in support of sovereign rights and reject the corrupt activities which have culminated in the crisis our tribe is facing now! The Tribal Council and membership of the California Valley Miwok Tribe, with its offices located at 10601 Escondido Place, Stockton, California - would like to thank Chaplin Jack Hyatt - host of KKUP 91.5 FM "Indian Time" (seated center), and Mr. David Romero - host of "Native Way" (seated right) for the opportunity to discuss various issues adversly affecting tribal governments and their members, caused by the current economic downturn and shortfalls in financing for various tribal programs. For more information about this radio program, visit "Indian Time" with Jack Hyatt and David Romero on MySpace. For the rest of what was discussed, please see the story below. The Tribal Council and members of the California Valley Miwok Tribe, with its offices located at 10601 Escondido Place, Stockton, California - would like to thank host Cihuapilli Rose Amador of Native Voice TV (which airs on Sundays at 6 p.m. PST on Comcast channel 15 in San Jose/Campbell) for inviting Tribal Chairperson Silvia Burley to discuss various issues which affect indigenous peoples' lives and future prospects. Miss Amador is also credited with co-founding La Raza Roundtable, as well as actively participating in the National Council of La Raza, based in Washington D.C., and has worked for decades in non-profit organizations such as CTC/WorkNET. She is a "Woman of the Year" award winner, as presented to her by the state of California in 2005. ..The Rest of the Story.. Along with the above mentioned topics at both the radio station and the television interviews, the discussions centered around a current event that can only be listed on this website, because when the full truth of what this website comprises of was originally listed on the Tribe's official government website, Scott Keep - Senior Solicitor of the Bureau of Indian Affairs, Department of the Interior - in a vain attempt to silence the voice of truth, orchestrated an attempt to either dissolve the official tribal site or at the very least, have it censored in an effort to still the Tribe's voice from exposing his nefarious activities and those of his inner circle; as well as corruption within the Bureau of Indian Affairs (BIA) and illegal actions being perpetrated against the Tribe by Troy Burdick, Superintendent of the Central California Agency Bureau of Indian Affairs (CCA/BIA) in conjunction with Keep. Mr. Keep has worked with a ficticious group of non-indians being led by Chadd Everone/Ludwig (this is Mr. Everone's third group - two previous groups failed). Mr. Everone's real last name was Ludwig, but he legally changed it in 1980. He is known to plagiarize other people's medical information for his personal use and refers to himself as "Dr.Internet". Mr. Everone's Washington-based attorney, Elizabeth Walker, has been working very closely with Mr. Keep, but at some point, Mr. Everone also hired an ex-colleague of Mr. Keep, a former solictor named Tim Vollman who although now in private practice, is utilizing a prior professional relationship with Mr. Keep to their advantage. Mr. Keep has been working against the California Valley Miwok Tribe since 2002, when this tribe, along with the Buena Vista Rancheria (also a federally recognized tribe) and the Chinook Tribe (a non-recognized tribe in Washington State) became whistle-blowers in the BIA "money for hire" scandal, involving their No.2 man, Wayne Smith. Since this time, the BIA has constantly chipped away at the Tribe's sovereignty and now not only has the Tribe on the verge of financial ruin, but is working with Chadd Everone/Ludwig to fraudulently create a leadership dispute, with hopes of removing our Chairperson and tribal membership's federal recognition. The BIA successfully created a leadership dispute within the Buena Vista Rancheria and had their chairperson removed from the tribal membership rolls. In the Chinook case, the tribe was denied federal recognition by Neal McCaleb - Assistant Secretary of the Department of the Interior (Wayne Smith's boss), a few months after the incident. Anyone can see by this what happens when you expose corruption at the BIA. Whether Mr. Keep has his own agenda or if he in some way is currently or in the future is to recieve compensation from Mr. Everone/Ludwig's ficticious group, whom is being supported by the money and power of big business (supplied by A.D. Seeno, owner of the Peppermill casino chain in Nevada and Seeno Homes whose corporate offices are located in Contra Costa County, California) is currently unclear, but in the process of the decimation of this tribe, Mr. Everone/Ludwig, with the assistance of Troy Burdick, is being allowed to cause irreversible damage to the memberships and tribal structures of two other local tribes; the Calaveras Band of Miwuk Indians and the Calaveras County Mountain Miwoks, by convincing members of these tribes whom are desperate in these trying times, to join him with promises of future casino riches (though what his true opinion regarding indigenous peoples cannot be disputed when you listen to the Everone/Ludwig audio archive on this site), not withstanding his actions are causing families in these tribes to fractionalize - turning brother against brother, sister against sister and in some cases, children against their parents. Mr. Everone/Ludwig has even initiated a phoney tribal membership identification card that he offered for $5.00 at a recent meeting. To anyone with $5, you could now be a member. His membership drive escalated at this point ($5 for federal recognition, who wouldn't buy in at that price?) and this ficticious group, with their fake identification cards, are now accessing and overloading all kinds of local services, depriving the local indian tribes in the area from receiving direly needed benefits. Disruption or cancellation of some services, as well as physical altercations, are becoming common-place and a people that used to live together within their culture now will not even acknowledge one another. If the current conduct of the BIA which has created this situation within our tribes is allowed to go unchecked and elected officials representing the districts in which the California Valley Miwok Tribe, the Calaveras Band of Miwok Indians and the Calaveras County Mountain Miwoks and their members are constituents, do not find the courage to intervene and correct these injustices, then the damage will be irreversible. We would like to thank Ms. Cihuapilli Rose Amador, host of "Native Voice TV" on Comcast channel 15 in San Jose/Campbell, Chaplin Jack Hyatt, host of "Indian Time" and David Romero, host of "Native Way" at KKUP 91.5 in Santa Clara, for being able to present these issues on their programs and for the open invitations for future interviews to update the hosts and their audiences as to what will eventually be done. Whether someone of courage comes forth or these despicable actions are allowed to continue, we know our voices will never be silenced. The California Valley Miwok Tribe (the "Tribe") provides its Response to the 'Interested Parties' Answer in Opposition to the Appeal & to Appellant's Response to Show Cause plus Response to Request to Expedite IBIA 7-100-A also a Response to Contingent Intervenor Status. Appellant opposes any and all documents posted on Interested Parties ('putative members' , of which the definition of putative is "supposed rather than real, alleged or assumed") web-site of http://www.californiavalleymiwok.com because Interested Parties do not represent the federally recognized California Valley Miwok Tribe and/or its legitimate Tribal Members, nor does Interested Parties have federal recognition as a Tribe, therefore, Interested Parties (by purporting themselves to be the California Valley Miwok Tribe) are in violation of the law and are committing fraud and identity theft. As for 580 individuals filing their genealogies with the BIA, Appellant's response is that that has no bearing on our Tribe or its enrollment process. The enrollment process is the inherent right of the Tribe and individuals who believe themselves to be Indian of any Tribe have the responsibility to contact said Tribe(s) and request an enrollment application and are expected to return the application to the Tribe with documentation verifying their Indian heritage and/or lineage as affiliated with said Tribe, and then the enrollment process begins. Appellant opposes Interested Parties leading IBIA to believe that any 'Tribal Council' appointed by Yakima Dixie (cir. 2003) was accepted by the BIA. Yakima Dixie has no authority to appoint a Tribal Council or any other official to represent the California Valley Miwok Tribe. Interested Parties mentioning "some 120 adult persons who are prospective Members" has nothing to do with the legitimate California Valley Miwok Tribe. Appellant opposes Interested Parties leading the IBIA to believe that the California Valley Miwok Tribe is the only Miwok Tribe in this area. Interest Parties fail to mention other Miwok Tribes such as Buena Vista Rancheria, Chicken Ranch Rancheria, The Federated Indians of Graton Rancheria, Jackson Rancheria of Me-Wuk Indians, The United Auburn Indian Community, lone Band of Miwok Indians, Shingle Springs Band of Miwok Indians, Tuolumne Band of Me-Wuk Indians, The Sierra Native American Council, American Indian Council of Mariposa County, Wilton Miwok Rancheria, the Calaveras County Mountain Miwoks, Miwok Tribe of EI Dorado Rancheria and the Calaveras Band of Miwok Indians. In the enrollment process it is usually found that individuals are lineal descendents of these other Miwok Tribes. Valley Miwok Tribe is no longer a federally recognized Tribe because it is considered unorganized. Being 'unorganized' in no way circumvents the inherent sovereign rights of the Tribe or its authority. In fact, the Tribe has a ratified Constitution, a General Council, Tribal Council, Ordinances, Policies & Procedures and Tribal Resolutions. The Tribe has passed all annual federal audits (without findings) of which it had received Mature Status in contracting. The suspension of the PL 93-638 Mature Status Contract was improper (without merit or due cause) and was instigated by the continued interference of Chadd Everone who's actions have caused continued hardships on the legitimate Tribe and its Tribal Members. In previous pleading, Mr. Chadd Everone claimed to be an representing Yakima Dixie (of whom continues to break the law and is currently serving time is State Prison), now Mr. Everone is submitting court pleading with Yakima Dixie's name being signed by Velma Whitebear (without certified documentation proving that Yakima Dixie gave his consent for any such person to sign his name to any document(s). (who due to his Gaming License is barred from associating with known criminals and/or felons) signed an agreement in which they conspire to overthrow our Tribal Government and appointing and/or electing Yakima Dixie or Velma Whitbear to the leadership position of the Tribe in which the above mentioned shall comply with said agreement. And to further their agenda, they hired Arlo Smith and Peter Melnicoe (former employees of the California Gambling Control Commission 'CGCC') to advocate on their behalf. Appellant Opposes Interested Parties accusations that I, Silvia Burley, Chairperson denied benefits to Tribal Members, in fact the "Tribe" has in the past and continues to assist individuals and non-recognized Indians on a daily basis, circumstances vary depending on the specifics of what is being requested. Due to the callous actions and continued threats of harm to Tribal Members by Interested Parties, the Tribe has erected a security fence around the Tribal Property. It is a known fact that the Interested Parties are associated with A.D. Seeno, who has and endless supply of money and is willing to assist them in overthrowing our Tribal Government so they can proceed forward with their casino deal and it is also a know fact that A.D. Seeno admitted he knew he was not suppose to associate with underworld figures or convicted felons, therefore, the Tribe and its legitimate members in fearing for their safety are vindicated in protecting themselves and the sovereignty of the Tribe. to benefit from a casino deal with his associates William "Bill" Martin, Le Roi Chappelle and A.D. Seeno Jr.
"The Appellant's Main Argument is Untenable"
Unfortunately, the Interested Parties do not understand what sovereignty means to a Federally Recognized Tribe and are willing to give away the inherent sovereign rights of the sovereign Indian Nations located in the United States of America, starting out by destroying our Tribe. Therefore, at a Special Election of the General Council, a change was voted upon and approved by the vote of the membership of the General Council and a revised copy of the Tribal Constitution was submitted to the BIA to file. A miss understanding occurred and the Constitution was returned to the Tribe. The Tribe's ratified constitution has been in effect since being approved by the Tribe and is in full effect today. The Interested Parties failed to inform the IBIA that the Declaration of Brian Golding Sr., Tribal Operations Specialist of the BIA was in retaliation. In a letter dated January 31, 2003, CCAIBIA granted the Tribe's official request to replace Brian Golding, Sr. as the Tribal Operations Specialist to the California Valley Miwok Tribe and in his place they assigned Carol Rogers Davis to serve as the SAOTR for the Tribes Indian Self-Determination and Educational Assistance Act contract (s). In 2004, the Tribe deposed Mr. Golding and a month after being deposed, Mr. Golding gave his retaliatory declaration. Appellant Opposes Interested Parties misleading IBIA to render Mr. Olsen's Determination of February 11, 2005 letter as a final Bureau action. The Tribe was not given due process and at the time was unaware that Mr. Melnicoe and Mr. Smith were in contact with Solicitor Scott Keep and Mr Jerry Gidner acting of behalf of the fictitious group claiming themselves to be representing the California Valley Miwok Tribe, in which untruths (without merit) were presented to Mr. Olsen unbeknownst to the Tribe (nor was the Tribe allowed due process to counter these vicious attacks) and therefore Mr. Olsen having heard only the side of the group with the agenda to overthrow our Tribe wrote a letter completely blind-siding the Tribe. In actuality, the second paragraph of the letter addressed to Mr. Yakima K. Dixie (dated FEB 11 2005) from Mr. Olsen states "Your appeal of the BlA's recognition of Ms. Burley as tribal Chairperson has been rendered moot by the BlA's decision of March 26, 2004". Numerous times, Mr. Dixie had been given "special treatment" affording him extra time to present his case and the Leadership case had been acted upon, not only by the Tribe in its inherent Tribal Appeals Forum but the Leadership question was rendered moot by the BIA, and in defiance of the final decisions made the Interested Parties ignored these official actions and continue to take up the Courts and the Tribes valuable time by resubmitting arguments that have already been decided upon and rendered moot. In doing so, the Interested Parties also are causing undue financial hardships on the legitimate Tribe and its members. Appellant Opposes Interested Parties claims and slanderous comments that I, Silvia Burley, Chairperson "hold myself to be sui juris, an un-reproachable sovereign authority for the Tribe" and the comment that my status was given authority by Yakima Dixie. When the Tribe organized in August 1998, an election was held in September 1998 in which official Bureau representatives Raymond Fry and Brian Golding Sr., were in attendance of our first election at that time there were only 3 adult members eligible to vote. Yakima was elected Chairperson and I was elected Secretary Treasurer. When Prop I-A and Prop 5 came into being then became the new phase of Indian Gaming. In 1998 Senator Slade Gordon declared a Moratorium of one year (1) on first time contracting and/or newly recognized Tribes, in regards to the P.L. 93-638 Contracting. Since we our Tribe was never terminated and had never contracted with the Bureau of Indian Affairs, we were considered a newly contracting tribe and had to wait one full year before contracting. In April of 1999 Yakima Dixie called together a special meeting of the General Council and complained that being Chairperson was too overwhelming and confusing and that he wanted to resign effective immediately because all he wanted to do was go fishing. Appellant Opposes Interested Parties slanderous comments as made in pleading suggesting that I, Silvia Burley, Chairperson or the Tribe in any way mishandled Tribal funds. In fact it is in the PL 93-638 Contract that annual federal audits be performed and our Tribe had received Mature Status due to our commendable financial management of said funding. The Interested Parties allege that Appellant has not provided provisions to the broader community or any financial support, yet the Interested Parties fail to show any documentation of the California Valley Miwok Tribe denying benefits or resources to individuals or community members. Appellant Opposes Interested Parties slanderous comments that I, Silvia Burley purchased the property at 10601 Escondido PL, Stockton, California 95212 for my own purpose. The comment made by Interested Parties is false and misleading. Unfortunately, the California Valley Miwok Tribe does not have a land base, reservation or Rancheria in trust (as many federally recognized Tribes have). The 0.92 of an acre that was deemed the Sheep Ranch Rancheria was deeded (in fee) to an individual in the Termination Era. As history shows, the land was given away to an individual by the United States but our Tribe was never deemed terminated, therefore leaving our status as that of a Landless Tribe and a Tribe without a credit history. The Tribe is within its rights to purchase property to be used as its office to do day-today business and for the use of its Tribal Officials and Tribal Members. All necessary legal documents have been verified in audits. It is not mandatory for the Tribe to forward its Governmental documents to individuals residing in State Prisons or to persons who have shown willful discontent and threatened harm towards our Tribe and its membership. Appellant Opposes Interested Parties accusations/comments "it is likely that some of the payments on the real estate where made from the P.L. 638 grant money". This is a false and misleading assumption on the part of the Interested Parties. In response to the Interested Parties comments to taxes not being paid on Tribal Property, if the fictitious group would stop interfering into the Tribe's Governmental Affairs, the Tribe could stop wasting money and resources defending itself against frivolous lawsuits and appeals brought on by the fictitious group, then the Tribe would be in a position to once again pay its debts. his repeat offenses of breaking the law. is out, the 0.92 acre held in trust for the individual, is used by Yakima Dixie as a safe haven to return to each time he is released from jail or prison. Yakima Dixie is not required to pay rent or taxes on the land or his home and according to the MOD he signed Midstate Consultants LLC, dated May 17, 2006 his outstanding legal fees are paid by A.D. Seeno (income Yakima receives (on his behalf as being the 'self appointed Chief of a fictitious group claiming to be a federally recognized Indian Tribe) and also, one can assume income generated from the MOA to Yakima Dixie has not been reported to the IRS). Appellant Opposes Interested Party (Chadd Everone) to have any authority in this matter, for he has hidden from the IBIA that fact that he is an associate of William "Bill" Martin and Le Roi Chaplle (developers), he continues to mislead the IBIA in believing that he is representing a large group of 'putative members' of Miwok Indians being denied benefits or enrollment. Mr. Everone's only interest in this Tribe and its functions are to overthrow the federally recognized Tribe and its elected officials, replace them with the phony group and proceed forward with his and his associates plans to build an Indian Casino, backed by A.D. Seeno Jr. a casino owner/developer located in Reno, Nevada and Contra Costa County, California. In a letter dated January 29, 2007, it clearly states that I, Silvia Burley am recognized as a "person of authority". It is with the purest intentions of the California Valley Miwok Tribe to work closely with the United States Department of the Interior/Bureau of Indian Affairs in repairing and rebuilding our government-to-government relationship, without the vicious attacks and continued outside interference of the fictitious group purporting itself to be 'putative members' and using malicious tactics (funded by A.D. Seeno to overthrow our Tribal Government for their own greedy agenda of acquiring an Indian Casino) by using shameless attempts to overthrow and/or override the inherent sovereign rights of our tribe. The California Valley Miwok Tribe, a federally recognized Tribe (listed in the Federal Register) has repeatedly requested assistance from the Department of the Interior / Bureau of lndian Affairs to treat our Tribe equally and fairly as it would any and all other federally Recognized Tribes, and afford us the protection of the Government, from harm being caused to our Tribe and its members by outside 'gaming developers' influences and interferences into our Tribal Governmental Affairs. Appellant Opposes Interested Parties Request to Expedite the Determination of IBIA #07100-A and/or IBIA 09-13-A. Due to the unwarranted hardships Interested Parties have caused to the California Valley Miwok Tribe, its Tribal Officials and its Membership, Appellant requests that a proper amount of time be given in this matter, affording the Tribe its 'Due Process'. Therefore, Appellant requests that IBIA Deny Interested Parties request to expedite the Determination of the IBIA #07-100-A and/or IBIA 09-13-A. I, Silvia Burley,Chairperson of the California Valley Miwok Tribe located at 10601 Escondido PL, Stockton, California 95212 declare that copies of the 'Response to Interested Parties Answer in Opposition to the Appeal & to Appellant's Response to Order to Show Cause plus Response to Request to Expedite IBIA 7-100-A, Also a Response to Contingent Intervenor Status' have been served by certified mail to the "Potentially Interested Parties", persons or entities and at the addresses indicated below. The original pdf. format version of this document may be viewed here. The hand-game or “hiding the bones.” The booming sound takes your breath away, squeezing out every last bit of courage, for I do not know the outcome of our fate, of our days left in this world, or of the days left of our Tribe’s sovereignty. Off in the distance rolling thunderclouds are rapidly approaching. We warn others of the immediate danger but they don’t take notice, they are deaf to our words. We yell louder of the approaching storm that is closing in, vastly approaching, to engulf us all. We yell till our voices go quiet. My body is weak, but I gather up what strength I can to face the wind. As the storm grows in size, my soul shudders with fear, the end is never as one expects it to be. Tears flood forward stinging my eyes like the heat of the lightening. The ground shakes, the wind blows, I find myself standing alone. Memories flash through my mind so fast that I can barely decipher them through the flashes of the lightening that is zigzagging across the sky. The music, I can hear the music of the old hand-game songs. I can see the rows of teams, the showing of the hand-game bones, the old songs pound louder and louder causing the rhythm of my heart to beat with the song. I become one with the music, my body becomes part of the song. I look with pride at my Grandfather for he is so crafty at the game and such a powerful singer. My Grandmother smiles and laughs as the hands are now stretched out, its time to choose, which hand hold the bones and which is empty? OHHHHH!!! HA HA HA HA HA!!!!! You loose, the hand is empty! The winning team keeps the stick and the bones are hidden again. The song becomes more intense. BOOM!!!!! More thunder. The storm is menacing. Darkness falls. The wind howls and lightening pierces the awesome picture that is developing in front of me. The music re-enters my mind, the hand-game. Our ancestors would know what to do. Think! Think! Although they have passed over, they are still near. They comfort us in sorrow and in fear. Please Grandmother and Grandfather hear me now. The storm is upon us and I am standing alone with nowhere safe to go. I’m facing my worst fears by standing here looking straight into the eye of the storm. How does such a storm happen one may ask? authority to sign any contracts and/or agreements on behalf of the Tribe. Instead of letting the matter go and/or approaching the Tribe, these two individuals hired another non-Indian from Berkeley, California to create havoc in order to destroy the rightful tribal members and legitimate Tribe. The storm begins to take shape, for now an ill wind begins to blow onward towards the California Valley Miwok Tribe. The Tribe tells others that a storm is approaching and what is causing it, but others are too busy with their own lives and their own problems, they do not believe that such a storm would overtake them as it is about to hit the California Valley Miwok Tribe head on. First, a group of individuals were put together who claim themselves to be putative members (false claim) misleading the local Bureau to believe that it can force these people into our tribe. We will call this the updraft (the transporting of enormous amounts of false information to officials). Secondly, there is the downdraft (the officials in the local Bureau who abuse their powers and give preference to the non-Indian developers with their phony group of people who are trying to steal our tribe). The updraft and the downdraft combined, creates a turbulent environment and the people who suffer from this violent storm are the California Valley Miwok Tribal members and the duly elected tribal government. Because the updraft and the downdraft have been able to freely interfere into our internal tribal affairs, the total destruction of our Tribe is what is being allowed to take place. The message is, this is not a one-time phenomenon. If we are left to stand alone, to fight this storm, the storm will rise again to devour more Tribes and innocent tribal members. We have continued to successfully pass our annual federal audits without ever having even one finding, yet the greedy developer “group” and the one local Bureau official have managed to work together to stop our RSTF monies and our PL-93 Mature Status 638 Contract. Now that they have strangled our Tribe financially, they are going to unilaterally try to force a re-organization upon our tribe. The phony group submitted their phony Miwok lineage/ancestry and forwarded it to the Bureau, and without giving due process, the local Bureau official and a couple of his official friends in DOI will finally destroy what is left of us. We have no resources to fight for our rights or our sovereignty. The lies that are being told are too overwhelming since they have the backing of a casino owner to finance them to steal our tribe. Their so-called chief is as we speak, serving a three-year sentence in Folsom Prison, California. OHHHHH!!!! HA HA HA HA HA HA !!!!!!! Do you not see the storm? Hear the thunder or see the flashes of lightening? The storm engulfs us. We pray for courage and strength to make it through the storm alive. I am asking that if you cannot see the storm, then please listen. HELP US!! Help us find shelter for the storm is taking everything we own. All we have left is our very lives, our memories, the injustices and the Indian blood that which pumps through our veins. Remember, the storm dissipates from the bottom up and the updraft is what caused this storm to begin. We must stop the updraft and the downdraft will stop itself. Please Grandmothers, Grandfathers, Brothers, Sisters; Cousins, Mothers, and Fathers, we need your assistance. Our Tribe has been here for centuries but can easily disappear in the blink of an eye. And what will be left is just an image pretending to be real. The individuals who will steal our image will be soulless, no true Miwok blood, no true history or ancestry. The phony group will have disgraced our people who have passed over to the spirit world. Our culture, traditions, memories and stories forever lost. Our Tribe is seeking shelter from this storm and is pleading for those of you who have heart, to please not turn away. Please don’t close your ears to our sobs or our pain, for once we are gone, we may never cross this path again. Generally this site is dedicated to the exposure of government corruption and the malicious and illegal activity of CCA BIA Superintendant Troy Burdick’s illicit relationship with Chadd Everone/Ludwig and his financial backer Albert Seeno, Jr. Even if these individuals are allowed to succeed by the very system that is supposed to prevent these kinds of intrusions into tribal sovereignty, this site shall continue to update and inform the public. The Tribe will never cease to exercise its 1st Amendment rights and dedicates this byline to the Chickasaw Nation of Oklahoma, Miccosukee Tribe of Florida, Quinault Tribe of Washington State and the Sac & Fox Nation of Missouri, all of whom recently have given their support to allow the Tribe to bring forth a new and competent legal team with the goal of finally putting to rest the fabricated stories of Chadd Everone/Ludwig and still the dark desires of Albert Seeno, Jr., and Troy Burdick. To these four tribes that truly understand and have come to our aid in writing and in funding, our people thank you for supporting tribal sovereignty. 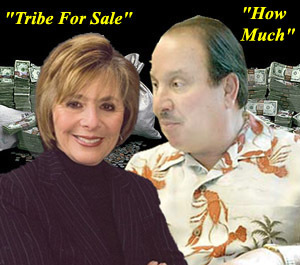 To further demonstrate the lack of ethical and moral behavior in the business affairs of Mr. Albert Seeno, Jr., a Nevada casino owner, home builder (Seeno Homes) and current developer/financial backer of the fraudulent group seeking to overthrow the legitimate Tribal Council, the Tribe has now added two published articles illustrating Seeno’s previous criminal activities. Also, in violation of book #25 of the Code of Federal Regulations (CFR 25), under the National Indian Gaming Commission Regulations, is his contract with Mr. Yakima Dixie, which discloses the direct intent to forcibly take control of the tribal government, in which he would then make cash payments directly to his co-conspirators upon the successful execution of their illegal agenda. The argument that Troy Burdick, Superintendent of the BIA’s Central California Agency, is using in his attempt to decimate the legitimacy of the Tribe by enrolling random people of his own choosing, is that there is a leadership dispute within the Tribe. All other arguments aside, the Tribe retains detailed records of Yakima Dixie’s own signed resignation of Chairmanship, personal voting history and subsequent 4-6 months worth of Tribal documents which he signed as Vice Chairperson, before he was intercepted and manipulated to enter into an unlawful scheme by Everone/Ludwig and his group. If this were not enough to still the argument that Mr. Troy Burdick, Chadd Everone/Ludwig and Mr. A.D. Seeno are trying to use to illegally steal the Tribe from its recognized members, the very fact that Mr. Dixie, aged 68 years, is currently serving a three year sentence in California State Prison in Folsom, California, should be enough for any reasonably intelligent, law-abiding citizen to accept that the question of leadership for all practical purposes should be over. Mr. Burdick, it is time to stop this ridiculousness and acknowledge the facts, even though they are to your personal disliking. The California Valley Miwok Tribe presents these informative videos detailing the dire situation that the Tribe is experiencing due to the actions of Troy Burdick, Superintendent of the Bureau of Indian Affairs-Central California Agency, A.D. Seeno, a greedy Nevada casino developer and Chadd Everone/Ludwig, an opportunist hoping to capitalize on the situation for his personal gain. The local Bureau of Indian Affairs office has been influenced by a group that intends to take over the Tribe in order to conduct casino gaming under the Tribe’s name. The Tribe is fighting to protect our tribal sovereignty to determine our membership and elect our own leadership. For several years, the California Valley Miwok Tribe has successfully fought off the efforts of Chadd Everone, a.k.a. Chadd Ludwig, and his associates who are trying to take over the Tribe. In addition to taking over the Tribe, Everone and his associates are seeking to take the Tribe’s share of the Revenue Sharing Trust Fund. Through the influence of two former California Gambling Control Commission employees, Peter Melincoe and Arlo Smith, Everone and his associates have successfully halted the disbursement of the Tribe’s RSTF money. Everone sought investors in his scheme by pledging the Tribe’s Revenue Sharing Trust Fund money. Everone and his associates have managed to convince the BIA that there is a large group of “putative members” of the Tribe that deserve to be enrolled into the Tribe. This is a fabrication that the Tribe is trying to dispel. Everone and company convinced Yakima Dixie, after signing a “development contract” with him, to assert that he never resigned his leadership position in the Tribe. In emails from Everone to a potential investor in his scheme, Everone revealed that he and his associates have plans to establish an Indian casino in California. Before they can have an Indian casino, they need an Indian Tribe. Their plan to take over the small California Valley Miwok Tribe hinged on Yakima. Based on the evidence, the Tribe believes that Everone and his associates are preying on the instability and simplicity of Yakima Dixie, the former leader of the Tribe, who resigned his office as Chairperson in 1998 of his own accord, concerned that his extensive criminal record would interfere with the Tribe’s plan for engaging a development partner for gaming. Until 1998, Yakima was the only member of the Tribe. Yakima spent most of his adult life in jail or prison for various crimes and was not willing to continue as Chairperson of the Tribe. Given Yakima’s low level of education, his life spent behind bars and his battle with alcoholism, he was easy prey for Everone and his associates. Tribe’s only member was Yakima Dixie until he enrolled five other relatives, including the Tribe’s current Chairperson. On September 24, 1998, the BIA acknowledged that Silvia Burley, Rashel Reznor, Anjelica Paulk, Tristian Wallace, Yakima Dixie, and Melvin Dixie were the only members of the Tribe and that they possessed the right to organize a government for the California Valley Miwok Tribe. With the assistance of the BIA in 1998, a majority of the adult members of the Tribe, including Yakima, voted to adopt a “General Council” form of government. This is memorialized by Resolution # GC-98-01, which was drafted by BIA staff and adopted by the members. A general council form of government consists of all adult members of the Tribe and decisions are made by a simple majority. On September 17, 1999, a simple majority of the General Council voted to approve a resolution to establish a Tribal Council and to hold elections for tribal leadership positions (See General Council Resolution R-1-9/17/99). The majority of adult members voted for Silvia Burley as the Chairperson of the Tribe, Yakima Dixie as the Vice-Chairperson and Rashel Reznor as the Secretary/Treasurer of the Tribe (See T.C. #99-010 and General Council Resolution R-9-/17/99). The Tribe, through its elected tribal leaders, then promulgated tribal laws for governing the Tribe, including a permanent election ordinance. It was this election ordinance under which Silvia Burley was elected Chairperson of the Tribe for a six-year term ending in 2006 by a majority of the adult tribal members. In 2006, she was re-elected to another six year term. Shortly after the election and after signing a development contract with Yakima, Everone convinced Yakima to attempt to rescind his resignation as the Tribe’s Chairperson (apparently Everone did not know about Yakima’s election to Vice-Chairperson). However, the BIA acknowledged the election results and for a time addressed Yakima as the Tribe’s Vice-Chairperson. When Yakima persisted in his complaint, the Tribal Council voted to provide due process by allowing Yakima an opportunity to pursue his grievance before the Council. He never took the opportunity (R-2-3-16-2000). Everone encouraged Yakima to take his complaint to the BIA. However, on February 4, 2000, the BIA notified Yakima Dixie that his allegations involved an internal tribal matter and should be handled by the Tribe. On March 16, 2000, the Tribal Council passed resolution R-2-3-16-2000, which resolved that pursuant to resolution R-2-10-9-1999 (Interim Operations Authorities and Rights for the CVMT), Yakima Dixie failed to pursue his right to contest his resignation from the office of Chairman by failing to respond to the Tribal Council within the prescribed 30-day period. When Yakima continued to complain however, the Tribal Council relented and voted to hire a tribal judge – an experienced Indian law attorney, to hear the evidence and decide the matter. Yakima was represented by several attorneys who submitted briefs and a large number of documents to support the claim that Yakima did not resign. After submission of briefs and documents by the Tribal Council, the judge scheduled a hearing. When Yakima informed the tribal court that he would not attend the hearing, the judge chose to decide the case on the written record. The judge reviewed all the evidence and in March 2004, determined that it showed Yakima had voluntarily resigned, voted in the tribal elections that followed and voluntarily participated in the Tribe’s government as the Vice-Chairperson of the Council after the election. That written decision was forwarded to the BIA. The BIA refused to give the tribal court’s decision any credence and thus has allowed the appearance of a conflict in the Tribe’s leadership to fester, despite the Tribe’s internal resolution of this issue. As far as the Tribe can determine, when Everone and his associates failed to destabilize the Tribe by asserting Yakima’s leadership, they launched a new effort to take over the Tribe through sheer numbers. Everone and his associates have succeeded in convincing the Superintendent of the BIA’s Central California Agency, Troy Burdick, that there is a large group of Miwoks who are “putative” members of the Tribe but who are being kept out of the Tribe. This is untrue. The Tribe has always been very small. In litigation in 2000, the Tribe’s former attorney mentioned in passing a potential Miwok pool of applicants of 250 members. The estimate of the number of Miwoks included all of the un-enrolled Indians who claim Miwok ancestry, but does not distinguish from which of the fourteen Miwok tribes in the state of California that those individuals are descended. Of the fourteen Miwok tribes in California, eight are federally recognized; including Jackson Rancheria, Chicken Ranch Rancheria, Buena Vista Rancheria, California Valley Miwok Tribe, Tuolumne Rancheria, Ione Band of Miwok Indians, Shingle Springs Rancheria and the United Auburn Indian Community (Miwok/Maidu). The remaining six tribes are not federally recognized—Wilton Miwok Rancheria, American Indian Council of Mariposa, Calaveras Band of Me-Wuk Indians, Calaveras County Mountain Miwok, the Sierra Native American Council and Eldorado Miwok Indians. The estimated 250 Miwok Indians could be descended from any one of the fourteen tribes, not just the California Valley Miwok Tribe. However, the Central California Superintendent, Burdick, has now begun a process to “include the greater tribal community” in the Tribe and has compiled a long list of applicants that the BIA intends to enroll into the Tribe under BIA criteria for membership. The BIA has vastly broadened the criteria for membership to include descent from a number of Indians, though in 1935, 1966 and 1998 the BIA recognized only one member. The BIA, on Burdick’s direction, has published a notice asserting these individuals have a right to be enrolled into the tribe under criteria set by the BIA and to then “reorganize” the Tribe’s government. The Tribe appealed the BIA’s actions to the Interior Board of Indian Appeals and to the federal district court in Washington, D.C. When the Tribe filed its appeal, BIA’s regulations (25 C.F.R. § 2.6) require the Bureau to halt any action based on the decision being appealed. However, BIA is plowing ahead with its “reorganization” of the Tribe and ignoring its own regulations. During this entire time period from 1999 to the present, Chairperson Silvia Burley has been the signatory to a mature status 638 contract (No. CT J51T62802) with the BIA, where she signed no fewer than twenty-four different contract modifications with the BIA, the most recent signed on September 19, 2007. Because the contract is a Mature Status contract, the BIA cannot cancel it without cause. The Tribe has been very conscientious in fulfilling its contractual obligations, keeping good records and passing the required audits. The existence of the 638 contract (under the Indian Self Determination and Education Assistance Act, “ISDEA”) between the BIA and the Tribe is crucial in determining tribal leadership because by federal law, the United States, through the BIA, may only enter into such contracts with either a tribal government or a tribal entity authorized by that tribal government. In the case of the California Valley Miwok Tribe, that tribal government has been lead by Silvia Burley. The Tribe’s responsibilities under its 638 Contract with the BIA have been to develop and strengthen the tribal organization. By agreement between the parties, the Tribal Council has promulgated tribal resolutions since 1999 in compliance with ISDEA, 25 U.S.C § 450f(a)(1).1 The Secretary of the Interior, through the BIA, has relied upon the efficacy of these tribal resolutions each year since 1999, to renew the Tribe’s 638 Contract. By accepting these resolutions, the BIA has recognized the California Valley Miwok Tribe’s Tribal Council, including its signatory and Chairperson, Silvia Burley, as the tribal organization with whom they have entered the ISDEA Contract and with whom it maintains a government-to-government relationship. The BIA has acknowledged the Tribe’s government in litigation in which the BIA is defending its contract with the Tribe before the Department’s Indian Appeals Board. Chadd Everone appealed the BIA’s distribution of the FY 2006 638 contract funds to the Tribe (See Everone v. Pacific Regional Director, Docket No. IBIA 06-70-A). The BIA responded to Everone’s challenge on January 26, 2007, wherein the BIA states that the Pacific Regional Director properly reversed Superintendent Burdick’s finding that the California Valley Miwok Tribe did not have an “organized government.” (Id. at 1). The BIA seeks to dismiss Everone’s challenge to the 638 contract and in so doing, states that “ISD[E]A contracts are between the United States government and tribal governments. It is a government-to-government relationship. Because the appellants [Chadd Everone and associates] do not constitute the tribal government they do not have a legally protected interest in the ISD[E]A contract.” The Bureau of Indian Affairs acknowledged in its pleadings before the Interior Board of Indian Affairs, that Silvia Burley is a “person of authority” within the Tribe with whom the BIA conducts its government-to government relationship. The BIA and other federal agencies have continually corresponded with the Tribe, recognizing Silvia Burley as the leader of the Tribe since 1999. On January 24, 2002, the Federal District Court for the Eastern District of California took judicial notice of the BIA’s recognition of Silvia Burley as the recognized leader of the California Valley Miwok Tribe (Sheep Ranch Miwok, et al. v. Silvia Burley, et al., 01-CV-01389-LKK/DAD)(Eastern District of California 2002). The court then dismissed the case filed by Yakima Dixie relating to his claim that he was the rightful tribal leader. The BIA informed Yakima numerous times that his complaint involved an internal tribal matter that should be handled by the Tribe. As recently as September, 2007, the BIA has parroted this same response in a letter to Congressman McNerney’s office. However, the BIA refuses to recognize the holding of the tribal court convened specifically to hear Yakima’s complaint in 2004. From July 12, 2000 through November 2, 2004, the BIA’s official correspondence to the Tribe recognized Silvia Burley as Chairperson of the California Valley Miwok Tribe. During that time, on November 24, 2003, the BIA released a recognition letter acknowledging that the BIA maintains a government-to-government relationship with the Tribe through the Tribal Council chaired by Silvia Burley. In February 2004, both the Superintendent of the Central California Agency of the BIA – Dale Risling and Raymond Fry, the Tribal Operations Officer, testified under oath that the BIA recognized Silvia Burley as the Tribe’s Chairperson and that the BIA had recognized her as such since at least 1999 (California Valley Miwok Tribe v. United States of America, et al., 02-CV-00912-FCD/GGH)(Eastern District of California 2004)(depositions of Risling and Fry, on file with the Tribe). Sometime between August 17, 2004 and November 2, 2004, the BIA changed its designation of Silvia Burley from Chairperson to “Spokesperson”, with no explanation as to the authority or legal basis for the change. Superintendent Burdick is aggressively trying to enlarge the Tribe’s membership based on the BIA’s own criteria of who should be a member of the Tribe. The Tribe appealed Burdick’s actions, which resulted in an automatic stay of BIA actions under Interior’s appeal regulations. However, BIA has ignored its own regulations and is pursuing this effort. After the Tribe filed its appeal, the BIA invited people to apply to the BIA for membership into the Tribe. The Tribe believes that the BIA received 486 applications to date for membership into this small Tribe. Superintendent Burdick informed the Tribe that the BIA will permit the applicants to “organize” the Tribe. The Tribe has been fighting a running legal battle with the BIA over these issues of inherent tribal sovereignty. However, without access to the RSTF money, the Tribe will not be able to retain its attorneys and will be forced to give up the battle and possibly close its offices. The Tribe has obtained evidence that the local BIA has encouraged Everone and his associates to submit a 638 contract with the BIA to compete with the Tribe’s own existing contract (See attached email from Everone). Because the California Valley Miwok Tribe has opposed the local BIA’s efforts to take over the Tribe, the BIA has asserted that the Tribe is not an organized tribe. In Indian country, this simply signifies a tribe that has chosen not to organize under the Indian Reorganization Act. Other “unorganized” tribes include the Navajo Nation, the Oneida Nation of New York, the Mooretown Rancheria, the Seminole Nation of Oklahoma and many others. However, Superintendent Burdick and others at the BIA are using this term to confuse the uninformed—including the California Gambling Control Commission. The Website of the California Nations Indian Gaming Association acknowledges that tribal sovereignty is exercised by Indian nations in efforts to fulfill basic governmental obligations, including providing for the general welfare of its members, developing economies within its jurisdiction and creating the governmental institutions by which local control and input are the foundation for tribal community prosperity. These inherent sovereign powers of a tribe – determining its own membership and electing its own leaders – are under direct attack by the BIA. The BIA’s efforts to usurp the inherent governmental functions of a sovereign tribe should be alarming to every tribe. The BIA continues to distribute money to the California Valley Miwok Tribe through its tribal leader, Chairperson Silvia Burley. The most recent payment was made in October, 2007. The contract, signed by Silvia Burley on behalf of the Tribe, is an agreement between the BIA and the Tribe, for the Tribe to provide governmental services to the tribal population, including enrollment and development of governing documents. That contract is currently in effect and will continue to be in effect for the foreseeable future because it is a mature status contract. 2 The Supreme Court in Cherokee Nation of Oklahoma v. Leavitt, 543 U.S. 631 (2005) found that ISDEA contracts are no different than regular government procurement contracts and that the Federal government is bound by the terms of those agreements and the ISDEA. 3 Official correspondence to the Tribe, recognizing Silvia Burley as the Chairperson has been received from federal agencies including the Department of Interior’s Associate Deputy Secretary of the Interior, the Office of the Solicitor and the Bureau of Land Management in Washington, D.C., from the Environmental Protection Agency, the Department of Health and Human Services, the California Division of the Department of Transportation, the Internal Revenue Service, the Indian Health Service, the Census Bureau in the Department of Commerce, the Greenville Rancheria NAGPRA Cultural Specialist, the California Tribal Business Alliance, the California Nations Indian Gaming Association, the National Indian Child Welfare Association, the California Gambling Control Commission, the California Resources Agency and others. Documents available upon request.